Nosco’s cGMP-based quality system has earned a reputation of confidence in our responsiveness, dependability, and timeliness. It is our goal to provide defect-free products and services, 100% on time, in complete compliance with customer and internal specifications. Nosco understands that it is necessary to build quality into our processes because it naturally yields quality product. We've developed a quality system that meets the needs of our customers and keeps the focus on continuously improving our products, while striving for zero defects. With a harmonized quality system in all manufacturing sites, and over 40 audits annually, we constantly seek to understand customer expectations. 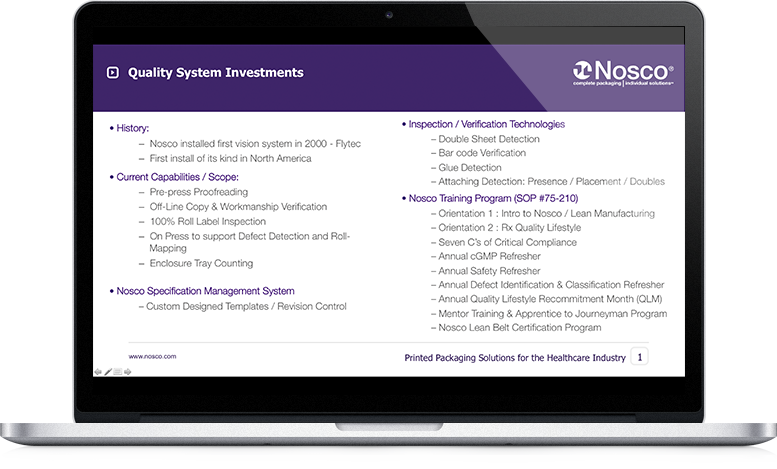 Some of our customers have begun doing audits using Nosco’s simple to use video-conferencing technology, enabling us to share quality documents and batch records electronically. This has saved our customers time and travel audit costs. We have a detailed training matrix in place, which includes both cGMP and safety refresher training. Many of our employees are Lean Belt Certified for continuous improvement. And, we have one of the most robust ethics training programs in the printed packaging industry. Our best-in-class, custom specification management system allows for smooth production and revision control, and allows us to make sure your unique set of requirements are met. Ask for a copy of our customer satisfaction metrics!